Do Houston Texans have enough to Beat the Cincinnati Bengals? We think Yes! 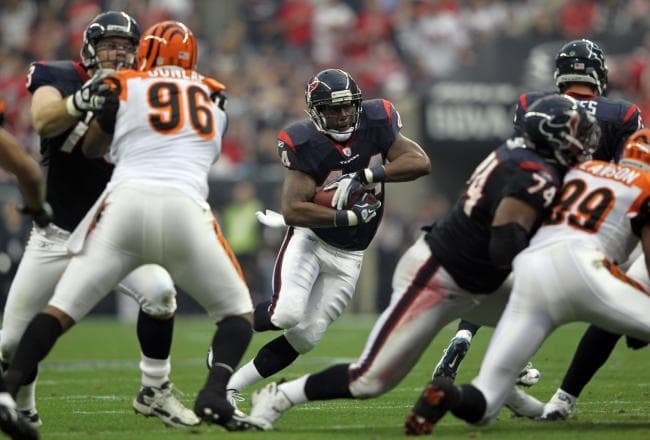 The NFL playoffs kick off in Reliant Stadium in Houston, Texas as the Cincinnati Bengals take on the Houston Texans in the AFC’s first Wild Card matchup. These teams faced each other last season to begin the playoffs, as well. Houston won that game 31-10 and was without starting quarterback Matt Schaub, who was out with injury. Schaub, now healthy will make his first career postseason start this coming Saturday in Houston. Despite the excitement surrounding the team making the playoffs for the second straight season, there seems to be a guarded optimism among the local media and the fans. The Texans have stumbled into the playoffs, losing their final two games and could have easily secured a first round bye with a win in either of their final two matchups. A preseason Super Bowl favorite for many NFL prognosticators, Houston has lost some of its luster with its play down the stretch. Schaub, especially, has been erratic in the latter third of the season throwing just one touchdown and three interceptions in his last four games. However, they may be able to get the job done without superior play from Matt Schaub. Defense and a power running game has been Houston’s recipe for success this season, and that should not change come the playoffs. They have a defense player of the year candidate in J.J. Watt who led the league with 20.5 sacks, two shy of the NFL record in a season. He also batted 16 passes, forced four fumbles and had over 100 tackles on defense this season. Arian Foster anchors a strong Houston running game, rushed for over 1,400 yards on the year and led the NFL with 15 rushing touchdowns. In last year’s playoff win against the Bengals, he ran for 153 yards and two touchdowns. Houston should return linebacker Brooks Reed from injury and may get defensive back Alan Ball back, as well. He has missed five games with an ankle injury. Cincinnati has made the postseason for the second straight time since the 1981 and 1982 NFL seasons. Despite getting the Bengals into the postseason, Dalton has looked shaky in recent starts. In last week’s game against Baltimore, a game in which the Ravens sat most of their starters he was erratic and has had a lot trouble connecting with top wide out A.J. Green as of late. Green and the Cincinnati offense will need to be able to produce against a top ranked Texans defense, especially due to the Texans ball control style of play. Cincinnati’s defense has been their catalyst down the stretch, forcing turnovers and limiting opposing offenses to little points and few red zone opportunities. They are third in the NFL in sacks, with 51, and have a formidable cornerback tandem in Terrance Newman and Leon Hall. Newman will return from a groin injury that kept him out in last week’s win over Baltimore. Also, leading rusher BenJarvus Green-Ellis will return at full strength after sitting out with a hamstring injury. The opening number was Houston -5 and the action has been mostly split down the middle with these two teams. All books are currently settled on a Houston -4.5 line. The total opened at 44 and is now at 43.5 or 43 at most books. The Texans have not looked good since a 42-13 drubbing at the hands of the Patriots a few weeks ago, but let’s not forget, this is an excellent home team. Not only that, they match up well against the Bengals who have struggled to stop the run all season. Yes, Schaub is more of a “game manager” than he is a QB who put a team on his back, but that is the Texans modus operands. Running game, play-action passing game, and good defense. This is a giant game for Schaub who finally has a chance to show the franchise and their fan base he can take this team to a Super Bowl. Also, Dalton and company have not exactly been world beaters on offense. Cincinnati went on quite a run to make the playoffs, but two weeks ago against a depleted Steelers’ secondary Dalton had one of his worst games of the season. He threw two picks and no touchdowns for 278 yards on 24 of 41 attempts, a game the Bengals managed just 13 points. Seven of these points were scored off a Cincinnati defensive touchdown. We love the Texans in this home playoff match-up and will be rolling with them against the visiting Bengals.